The most frustrating thing about being a scientist skeptical of catastrophic global warming is that the other side is continually distorting what I am skeptical of. In his immodestly titled New York Review of Books article “Why the Global Warming Skeptics Are Wrong,” economist William Nordhaus presents six questions that the legitimacy of global warming skepticism allegedly rests on. Since the answers to these questions are allegedly yes, yes, yes and no, no, no, it’s case closed, says Nordhaus. Except that he is attacking a straw man. Scientists (or non-scientists) who are “skeptics” are skeptical of catastrophic global warming—not warming or human-caused warming as such. So much for 1 and 2. We refuse to label CO2 a “pollutant” because it is essential to life and because we do not believe it has the claimed catastrophic impact. So much for 3. And since 4-6 don’t pertain to the scientific issue of catastrophic warming, so much for them, as well. The object of our skepticism, catastrophic global warming, means warming caused by greenhouse gasses that would so dramatically heat up the earth that despite the proven climate adaptability of hydrocarbon-powered civilization (see “How Capitalism Makes Catastrophes Non-Catastrophic”), populations the world over would experience impoverishment, mass suffering, and death. Why are we skeptical of this claim? Because there is radically insufficient evidence for it. This may seem implausible, because the news media bombard us with stories of new studies, new findings, new models, new international summits allegedly confirming catastrophic global warming. But what these stories leave out is the evidential status of these developments—what any given study or model actually proves. And the answer is, little to nothing, because the present ability of scientists to understand, model, and predict the climate is far, far lower than we are led to believe. To say that modeling the climate for long-term predictions is difficult given the current state of climate science is like saying that it would be difficult for your five-year-old son to build a 400 horsepower car from re-purposed Toys ‘R’ Us purchases. Imagine that he comes to you with pages and pages of plans he’s sketched out in crayon. The “car” will cost $22,827.35 worth of toys. Why wouldn’t you reach for your credit card? Is that because you’re against teaching kids engineering? Is it because his sworn enemy, your daughter, is paying you off? Or perhaps it’s because this project is obviously beyond the capability of a five-year-old, and that his crayon schematics don’t offer convincing evidence that he is in fact the kind of once-in-a-generation prodigy who could somehow pull it off. If one understands how monumental an undertaking it would be to produce a sound climate model, one can see that today’s climate modelers are making assertions no less implausible than our five-year old’s fantasy. In physics it is generally possible to exactly predict the behavior of systems involving two independent bodies, whether planets interacting through gravity or elementary particles through the electromagnetic field. More bodies means no exact solution to the dynamical equations and a zoo of different approximations, usually requiring computational simulation, which takes more and more time as the number of bodies being simulated increases. Indeed the computation time generally grows exponentially with the number of bodies. The global climate system comprises an astronomical number (at least billions) of effectively independent “bodies,” which is to say of isolatable, relatively uniform chunks of air, ocean, and earth. Their interactions span the complexity spectrum, from the mechanical push-and-pull of an ocean current to the lesser-known dynamics of cloud formation to intricate, biological mechanisms like plant growth and respiration that have evolved over billions of years. Solving this kind of complex system is outside the realm of controlled approximations and reasonable estimates. It’s in the realm of random stabs, on any objective assessment of our current scientific powers. Since attempts to model this system are the basis of claims for catastrophic global warming, the evidence we need to consider pertains to whether or not such models are capturing enough of the detailed mess of forces that actually drives the climate. Many different climate processes affect the energy balance between the earth and outer-space and thus affect temperatures on the Earth. One such process is the greenhouse effect, by which CO2 and other gases trap some extra solar energy in the atmosphere and convert it into heat. It is widely acknowledged that the CO2-linked greenhouse effect itself can produce only a modest warming going forward because the incremental warming produced by each extra liter of CO2 gets smaller and smaller as more CO2 is added. The catastrophist projections are based on the idea that this modest warming will trigger an entirely separate set of feedback mechanisms that will multiply the warming many times. For instance warming is projected to increase ambient levels of water vapor, itself a greenhouse gas; melting ice will expose more earth or open water, which tend to absorb more solar energy as heat; temperature-linked changes in cloud patterns affect how much solar energy gets reflected back to space or back to the Earth. There are also negative feedbacks, meaning processes that come into play due to warming, or to CO2 increases, that wind up counteracting that warming. Examples include enhanced re-radiation of energy back into space at higher temperatures, increased absorption of CO2 into the oceans, and increased quantities of organic matter capturing CO2. Indeed some supposedly positive feedbacks, like certain cloud effects, may turn out actually to be negative ones. Moreover, nature does not simply provide us with a list of all the relevant feedbacks, or climate processes in general. There is no systematic procedure by which the set of processes included in current climate models are picked out from the catalogue of all possible such processes. The procedure is simply for modelers to engage their own imaginations, given our current knowledge, to conceive possible effects and gather evidence to confirm or falsify them. How many known ones have been intentionally discarded due to a lack of knowledge and evidence about how to incorporate them? How many have just not been thought of to date? In a certain sense, this is the nature of any scientific theory. But this is why such theories have to produce specific, detailed predictions, confirmed by observation, to show that they have captured the relevant causal factors. Apart from this, there is a lot of room here for the ultimate outcome of the models to be controlled by ideological predispositions—like that, of all the underlying drivers, the decisive one just happens to be CO2, the one with a clear link to the functioning of modern, industrial capitalism. What would be a rational response when your five-year-old car enthusiast presents you with his crayon plans, protesting that he’s also proven his case by putting together a scale model in Legos? First you might point out that while his plans are impressive for a boy his age, it’s rarely the case that reality works out just like a priori plans and models suggest. Rather than setting him loose at toysrus.com with your credit card, you might suggest he start off with a scaled-down project, like an RC kit. Then, if that’s a success, maybe an introduction to simple wood and then metal work. As he gets older and proves himself at each stage, he could move on to machine shop projects, welding, and an apprenticeship with a real car mechanic. This kind of demonstrated, step-by-step progress is how legitimate inventions, and inventors, are made. At the end of the process, they no longer agitate for sizable investments on the basis of their original crayon plans. And such demonstrated, step-by-step progress is exactly what a reasonable person ought to demand from the global warming catastrophists. Not mere simulations, generated by model code that they control and have played with for years. Since the odds are so small, a priori, that they have actually cracked the excruciatingly complicated problem of global climate prediction, we need dramatic positive evidence. Lesser evidence is powerless to overcome the overwhelming odds against being able to delicately sort out the mess of climate drivers and feedbacks. And that’s only half the problem. Before we can test models, we need this historical climate data to be accurate in order for the comparison to mean anything. Even for the one central climate variable, global average temperature, the reconstructed data is fraught with uncertainties and scientific misconduct. What has always to be kept in mind on these issues, is (i) the massive complexity of the problem the catastrophist modelers are claiming to have solved relative to the current state of climate science, and (ii) what this implies about the onus of proof. Their claim is to have accomplished a scientific miracle with tools that by any reasonable analysis are far from capable of the task. Absent shocking evidence of success on their part, the conclusion to draw is not: catastrophic global warming has just moderate odds of occurring. The conclusion is that these models bear as much relationship to reality as your son’s crayon plans bear to a real car. And suggestions about how to transform the entire world economy based on these models should be treated accordingly. Eric Dennis, who holds a Ph.D. in physics from UC Santa Barbara, is a Senior Fellow at the Center for Industrial Progress. Those kind of assertions do not require, methinks, a detailed simulation of the planet. Except maybe for b1, but those could perhaps be demonstrated on a much more local scale. The climate models only come in when you want to try and calculate the magnitude of the temp increases, or calculate what effects the increased temp would have. Um, or is this maybe what you said… (checking)… “…attempts to model this system are the basis of claims for catastrophic global warming…” Yes, but also no. The alarmists are not here to execute the scientific method, they are here to confuse (i.e. LIE to) the public: and few things confuse so well as conflation. A good, gentlemanly account of the complicated complexity involved for the nascent science of climate study. Attempting to build bridges to climate jihadism with kind sensibility is fraught with the risk that such an approach will be seen as weakness, not strength. In my view, only Nordhaus questions 1 and 2 have scientific meaning. Question 3, as stated, is ridiculous; CO2 is a pollutant only in the sense that oxygen and nitrogen are pollutants: the issue is one of dosage. Further, I don’t think the evidence for question 1 is unequivocally “yes,” since baseline data is at best questionable and it’s not clear what the significant trend lines determining increases or decreases should be–a century, a thousand years, 10,000 years? As for question 2, the operative word is “important.” Does important here mean causally significant? If so, the science is unsettled as far as showing that humans, of themselves, are causing problematic “warming.” Does important here mean “contributing” on an ongoing basis? If so, the answer then is surely yes, in the same way that all organisms contribute to climate change patterns. But are our influences more “causal” than those of insects. Or solar activity. Or orbital perturbations. Or still not well understand combinations of all of the above. Stay tuned over the next several hundred years to find out. Meanwhile, reasonable people, because the science is unsettled, should seek clearer answers than we presently have for what the long term consequences might be for annually dumping 30 billions tons of CO2 into the air and earth (and it might soon be double that amount). This is non trivial behavior that may indeed affect feedback mechanisms in ways that will come back to haunt us. cb, I’m adraid at least your b1, b2, and a3 all require simulation of global climate dynamics. Feedbacks are inherently part of an integrated system; we can isolate them conceptually, but the physical processes are interconnected. I tell folks all the time that the most important issue in the global warming debate is, when someone is saying that the other side is right or wrong, to be very clear as to exactly what proposition is being debated. I actually got a chance to have a few public debates about this before alarmists agreed as a team never to engage in public debates any more. I would be talking about the poor science around feedback amplification and they’d be countering with a chart of warming over the 20th century. For some 35 years I have disbelieved the anthropogenic global warmers (AGWers) because of two essential factors that they and even the skeptics seem to overlook. 1) when the dinosaurs thrived, temperature and CO2 levels were much higher than today (Triassic and Jurassic Periods). 2) about 1,000 C.E. the Vikings sailed to Greenland & Newfoundland partly because the climate was much warmer than today (Medieval Warm Period – MWP). There was/is data that demonstrated these two things as fact. The AGWer scientists, politicians and activists claimed recent warming trends were unprecedented in the last 200,000 years (or a similar large figure that kept shifting). The MWP was ignored. To do so they could only be incompetent, or lying. Obviously they were *evading* essentials, so as to focus on narrower details that supported their a priori conclusions. Michael Mann’s Hockey Stick graph obviously dropped or masked the MWP somehow. Then we learned of Mann’s perfidious data transformation (any data would produce a hockey stick graph). This graph demonstrates, blatantly, that the above facts remain unassailable. Therefore the only valid conclusion has never changed: natural phenomena outweigh the man-made in incontestable ways. Billions of tax dollars, confiscated from struggling citizens, have been wasted by ideologues seeking some way of restraining industry, travel and even plastics, —anything that improves human lives. They are misanthropists writ large. coyote, I enjoyed your article, and in fact it was part of my motivation for this post. You provided a good, objective overview of what we know about the climate and what the catastrophists are seeking to prove. I wanted to flesh out the important cognitive point that the burden of proof is not symmetrical for the two sides, and to give people a feel for the magnitude of the scientific problem the modelers are brashly claiming to have solved. Regarding Mann’s “hockey stick graph”. This was just one of numerous studies, the only unique thing about it is that its conclusion are 180 degreees out of phase with the 1,056 other studies of the MWP and the LIA. (These studies are all accessible (researchers, research institutions, country, site, etc.) at co2science.org. While hundreds of these studies came in before Mann’s studiy, at least a couple of hundred have shown up since Mann’s study (and in spite of it) and confirming studies continue to arrive regularly. Mann’s study has been debunked by several credible scientists. I’m not aware of any complaints about the (so far) opposing 1,056. Mann’s study is bogus, (not unreasonable, given that he only performed one, and was an avid believer in anthropogenic warming long before his hockey stick so likely just confirmation bias. Wikipedia mentions 12 other studies that broadly agreed with Mann’s study (but these 12 all used the same questionable data, so the only possible confirmation is of Mann’s arithmetic. How Mann could render both the MWP and the LIA to be regional rather than a global event, is itself a good question. Using the valid data confirmed by all the other studies, our current warming began around 1680 (at the bottom of the LIA – meaning lowest temperature, and not at the end of the LIA which is not well defined and not relevant in this case. That gives about 200 years of natural warming before co2 began rising and before the industrial revolution. Putting salt on the tail of operating definitions and meaningful propositions, clearly defining their range and scope in order to get testable hypotheses, is the task at hand. The prospect for this diminishes if confirmation bias is not properly factored–and vanishes almost entirely if the inquiry is vetted in media outlets whose livelihood depends upon melodramatic sturm and drang. All of those Climate Reseach Unit (plus affiliates) computer models assume that co2 warming is amplified by a factor of 2 to 3. In other words the tempeature increase brought on by water vapor has 2 to 3 times the effect of the co2 which prompted that feedback. But their projections are all low, even after an almost annual ritual of tweaking their models. That’s because low cloud cover is actually a negative feedback. Not only that, satellite measurements are now showing that when the planet is warmer, more heat is escaping back to space. (That’s, in effect, yet another negative feedback. Finally, co2 is now almost 400ppmv. It’s increase has been steady, generally around 2ppmv per YEAR. By 2099 the co2 level will be around 600ppmv. But co2 has been many times higher than that, and for hundreds of millions of years, and we know that lifeforms not unlike our own survived during that era. It’s only been at 280ppmv for the past few hundred thousand years, up until around our industrial revolution. A crowded gymnasium with poor venting can easily be at 1000ppmv. Submarine crews live in 3000 to 5000ppmv. 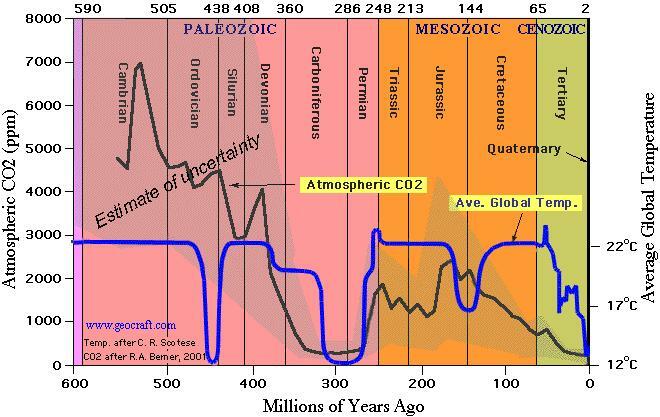 co2 has been much higher than now during 2 ice ages and going into one ice age. Plants absolutely love the stuff and, at higher levels, need less water. As for the rest of the proof, go to Joanne Nova’s site (her spouse, Dr. David Evans worked as a climate modeler for the Austrailian government for quite some time. Get the PDF version of “Climate Coup – The Science”. The more you find out, the more angry you’ll get. Yeah, paleo-conservatives are dinosaurs and are banking on global warming as they are cold-blooded. I find it instructive that John Christy and Roy Spencer, who are the first to have access to the only source of accurate temperature measurements, publish a graph of average global temperatures because that is what the media wants but always add a disclaimer that the data have no predictive value. I have had a question about the positive feedback for a long time maybe someone here can answer. My understanding is the claim is CO2 will cause some warming which then causes more warming through positive feedback (due to water vapor according to an earlier post). My question is if it is the warming which causes the positive feedback wouldn’t we get positive feedback from any warming no matter what the cause? In which case wouldn’t our climate have become catastrophically warm long ago? Since that hasn’t happened doesn’t that prove there has to be some kind of negative feedback which prevents runaway warming? Any help would be appreciated. Kendall, Good question. Yes some of the feedback mechanisms would apply to any initial warming stimulus, no matter its cause. And our climate has probably been much warmer at various times in the past. But yes, the catastrophists are essentially claiming that the only significant fundamental driver of temperature instability over the last 1000 years or so has been CO2 emissions from man, which is a rather bold and unsubstantiated claim. An alternative hypothesis is, as you say, that their models have systematically underestimated negative feedbacks—and that it was dramatically (but not catastrophically) warmer at past times in recorded history. – Kent Jeffreys, Competitive Enterprise Institute, “Why Worry About Global Warming?,” National Center for Policy Analysis Report No. 96, February 1991, p. 6. This is simply not true. The vast majority of ‘non-scientists’ still have trouble accepting that the Earth is warming and that it is partially attributable to the significant increase in CO2 from man-made sources. The 2nd comment on this page says, “Further, I don’t think the evidence for question 1 is unequivocally “yes,” since baseline data is at best questionable…”. How can we engage in an informed debate on CAGW when people don’t even accept the fact of AGW? For more than a century scientists have been wondering about the effects of man-made greenhouse gases in our atmosphere – are we having any effect? Over the last 40 years or so the question has been answered and our activities can indeed affect the Earth’s atmosphere. It has been proven for CFCs and now with CO2. Scientists should be skeptical – it is how and why the scientific process works so well. The difficulty is when scientists see a problem that could potentially harm other people. Should they say something and perhaps get it wrong or not say something and end up right? In this case, and in the case of CFCs, scientists warned the leadership and it is up to the leaders to decide on the path forward. In the meantime, scientists should continue their research and continue providing leaders with their evidence. The difficulty with this issue (AGW/CAGW) is that it has become an ideology based issue in the US with people who know nothing about the science are attacking the science. Attacking the science should be left up to scientists – not popular opinion or polls. To use the analogy in the article, it makes as much sense for the population at large to debate the science as it does for my wife (who knows absolutely nothing about cars) to evaluate if the hypothetical 5 year old engine designer is a progeny or a dreamer. She simply wouldn’t know a 400HP engine from a lawnmower engine. It also does no good for scientists to debate the science in the public forum. If scientists ‘dumb it down’ enough for laymen to understand it the nuance of the actual debate can easily be lost. To understand just how bad it is read the comments section in Yahoo! News about a global warming story and you’ll understand how woefully ignorant of the substance of AGW a lot of people (and some of our leadership) really are. And articles like this further that ignorance by glossing over the simple facts that are assumed to be known. Just like a lot of people wish Muslims would be more vocal in their opposition to violence (who isn’t opposed to violence so why do we need to be ‘more vocal’?) it would help if skeptics would be more vocal on the basics of the theory. State right up front that there is no controversy in that CO2 (no matter the concentration) is a greenhouse gas, the Earth *is* warming, the warming *is*, in some part, attributable to man-made CO2. It would go a long way towards educating the populace and leadership about the ‘real’ issue of how much uncertainty there is in the C of CAGW. I thought writing this essay was a good start. Apparently you disagree although it is not clear why. The problem with having laymen just leave the matter up to scientists is that it’s about whether these laymen will be allowed to use their own property to enhance their own lives or not. The alternative is between freedom and industrial progress, on the one hand, and severe economic controls and industrial decline, on the other–for everyone, including the laymen. Were I in that position, I wouldn’t accept just forfeiting the decision to someone else without doing my best to understand the reasoning. And I don’t see why you think the mere existence of even an iota of man-caused warming, independent of its quantitative effect on climate, is so important. Sure, man’s CO2 emissions have a finite positive effect on global average temperature. So does cooking a pot of soup. As I noted previously, the second commenter to this article doesn’t even accept that the planet has warmed over the last 50 years – regardless of the reason! It is that level of ignorance that I feel we must combat. By not educating the public, the media and others are doing a huge disservice to the scientists who are being vilified for simply doing their jobs. Even more important in my mind though is that a significant portion of the public is beginning to think that science is something to believe or disbelieve based solely on their personal opinions or experiences. As you well know, science has long since transcended what our senses tell us. Our senses told us that gods were responsible for meteorites, radiation burns, flooding, etc. We now better understand how these things work and don’t need to invent ‘Poseidon’ to explain floods and earthquakes. We cannot afford a society in which scientists have an ‘approval rating’ as low as our politicians’. So to me, this isn’t simply an argument of AGW vs. CAGW – this is huge problem for the future of science and technology in this country. So yes, an iota of warming *does* make a difference because it highlights the perceptions of the uninformed public versus the facts of the issue. The pubic conversation has nothing to do with the science and that *is* a problem. I don’t dispute any of the remaining part of your article because, yes, there is some level of uncertainty in the predictions made by scientists and models and also because I am woefully ignorant of the complexities involved. That being said, what if scientists sat on this data for another 50 years until they were certain it was right and by then there was no chance to avoid CAGW? Which is worse, crying wolf or staying silent as the herd gets thinned? I personally think scientists are doing the right thing by telling leadership their ‘best guess’ at this time given the possible repercussions. The leadership’s response is another issue and the two issues should not be intertwined. The mark of a good leader is to take all sides of an issue and based on their judgement come to a reasoned course of action. Laymen may feel free to judge the leader’s decisions but should not, in my opinion, resort to attacking and ridiculing the scientists when they have no clue of the science involved. So, my issue isn’t with the debate over the science within the ‘educated’ community – that is how the scientific method works. My issue is with uninformed people who debate the science thinking they are making well informed arguments when it is actually their prejudices coming through. I often use the “5 Why’s” method for root cause analysis both at work and in my personal life. Anytime I challenge a layman to explain “why” they believe or disbelieve AGW they stop the game before getting to the 5th why (almost always it stops at the first why.) In this case it is absolutely clear that they don’t have a scientific foundation for their belief one way or the other. Nor do they see the contradiction in their stance. As a layman I believe you and I hear wildly different opinions concerning AGW. I read news stories on Yahoo! and the vast majority of commenters there are simply people who read the news and don’t do their own research. You on the other hand probably read the white papers and journal articles and debate those amongst other informed scientists. It is this (assumed) disparity that lies at the heart of my argument against a portion of your article. I do very much appreciate you doing a deeper dive into the details of the debate and is what I try to inform people of on Yahoo! – that AGW is an accepted fact. That the continuing debate in scientific circles is not about AGW but instead how much man has contributed to the warming and how much the secondary effectors will affect the future climate. I am usually labeled as a libturd, democrap and other such names. Libturd I actually like because I consider myself a libertarian so it fits – sort of. I think making tenuous analogies and dismissing Mr. Nordhaus does not help. It is obvious you are talking past each other and by clearly conceding his true statements before countering the ones you disagree with would go a long way towards furthering the conversation in a positive direction. Thank you for allowing me to clarify my opinion – at least I hope this offers some clarity. And thank you for offering your skepticism and more importantly your rationale for that skepticism.